Rewind to Thanksgiving....our youngest daughter is here...and I was jumping for joy when I heard what she wanted for Christmas....a Sewing Machine!!!!! Over Thanksgiving weekend Maddy asked could I help her make a Christmas Stocking for Abby, her significant others daughter. My reply, "Well of course...when do you want to start?" I've never made a stocking so we just decided to build it from the ground up. We traced the shape of a stocking onto paper and started interviewing fabrics. Maddy's initial idea was to make a crazy patch stocking, sort of traditional, with Abby's name across the top. Much to her surprise, I introduced my new embroidery machine to her and the ideas didn't stop...LOL. So very far from traditional. When I told Maddy she could use anything she wanted and it could look like anything she could think of....well...traditional quickly went out the door. She was absolutely thrilled when I told her that it was only a Christmas Stocking and if she doesn't like it when it's done...ya just make another one next year...no big deal! Maddy was beaming....oh the freedom that gave her....Let the Fun Begin!! I think we went through every bin and drawer looking for fun combinations. My advise to Maddy was...you'll know it when you see it and don't stop until you see it. I also suggested we take photos of the different arrangements as the photos provide a different perspective somehow. After going through all my fabrics I got frustrated and called Waldo and asked could we come over and search her stash. Success! Waldo had this plaid that Maddy loved and some cute hot pink trim too. She was so excited to show off her first creation. Maddy quilted the fabric and did all the sewing. I operated the Embroidery Machine and she choose all the colors. And then she added some bling. Annie, Maddy's youngest "child" is now sporting a holiday collar sleeve. Could you forward this survey to some of your friends (and ask them to pass it on as well)? I need married couples living with their spouse who have NOT had a head injury.....it would be even better if they were married to someone who has had a TBI (Traumatic Brain Injury...including concussion) at some point in their lifetime....but not necessary as I need control subjects too. Realistically it takes about 15-20 minutes. I need at least 20 more participants or I risk not being able to move on to internship!! eek!! Both Floriani Embroidery and Anita Goodesign are offing Great Deals and they are ending on November 30, 2012....Don't Miss Out!! If you are love machine embroidery than you already know about the high quality digitizing that Anita Goodesigns offers. Did you know there is a Fall Special going on right now and it ends November 30, 2012. Join the Diamond or the Quilting Club before November 30, 2012 here at IHAN ® and you will get 8 Free Collections of your choice plus you will recieve the New Premium Collection, "Art Quilts." Below you can see the design I made from the Art Quilts Collection....and I'm a newbie to machine embroidery. I was very impressed with how well mine came out. Imagine being able to make all of them? Well, you can when you join the Diamond, Quilting or VIP Club before the end of November. IHAN® Creative Group Members receive an additional bonus! Are you a member yet? It's completely free and you can click HERE to sign up today. When you purchase 60 spools of any combination of Floriani Thread on or before November 30, 2012 you will recieve 2 Thread Storage Cases and 10 Floriani Embroidery Designs FREE. Purchase this beautiful Holiday Thread Set that contains 12 Large Cones of Floriani's beautiful metallic threads and 12 Large Cones of polyester in brilliant Floriani colors and you'll receive Walter Floriani's Vintage Christmas Signature Embroidery Design collection absolutely free! Excellent Tools (made by Famore for Floriani) and Free Embroidery Designs....now that's a great deal! Get the best prices of the year! CLICK HERE to view all the CYBER MONDAY HOT DEALS. Don't forget to check out the IHAN® Holiday Specials too! 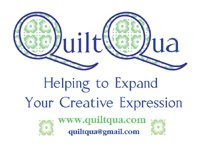 In the "Happy November IHAN® Newsletter" I agreed to share my Quilt Market Swag with anyone who sent an e-mail saying they wanted to be included in the drawing. Are you an IHAN® Newsletter Subscriber? If not, you may want to CLICK HERE :) More Swag to come! I Brought Prizes To Giveaway Too! I brought back some fun things to giveaway to IHAN ® Newsletter Subscribers ONLY. There are 2 fabric rolls from Robert Kaufman, Anastasia By Leesa Chandler, a sampler package of Aurifil Threads and Pony Express by Jodi Burrows (Square in a Square). There will be four winners were selected at random on Thanksgiving Day. If you would like to be a lucky winner send an email too IHaveANotion@yahoo.com with "Enter me in the newsletter drawing" in the subject line. It's that simple! #49 Felicia Few- Pony Express by Jodi Burrows (Square in a Square). And to those who don't celebrate Thanksgiving today, Happiest and Healthiest of Days to you! Maddy, our youngest daughter, James and Abbey, Maddy's significant others, were here visiting and have headed off to celebrate Thanksgiving with James' family. I'm thinking they are going to be having a ball today. I just love their costumes....very apropos! I had something happen to me yesterday that makes today every so much sweeter. Most of you know Waldo...aka Miss. Rosemary, my girlfriend or heard me speak of her. Let me digress, just for a sentence. Last week Waldo was in the hospital with some blood clots in her legs and one on her lung. She came home last Thursday and had been doing just fine. I've seen her several times and as recently as a day and a half ago when she phoned to say she was out of black thread. She popped in to borrow mine and she looked great. Back to her normal sweet self. Yesterday afternoon, I was getting out of my van in the driveway and another neighbor approached me and told me, " Rosemary has been taken by ambulance to the hospital, she had a pulmonary embolism, the family had been called in and decisions were going to need to be made." She also suggested I wait until the family calls me and not to rush up to the hospital. I felt the air being sucked out of me and all I could do is cry. The grief was overwhelming and heavy as you can imagine. I waited until 6pm and called her daughter. I was told of course it is fine to come up to the hospital so up I went. Do you know what I saw? My girlfriend was sitting up in the bed and looked tired....but just like the Rosemary I know and love. I climbed up in the bed next to her and hugged her and cried.....the relief of knowing she was fine was so joyous. Apparently the neighbor didn't have the correct information and I"m soooo very glad she was wrong. The doctor thinks it might be her gallbladder. Well shoot....ya can live just fine without one of those.....hooray!!!! I spent the night with her at the hospital and this morning, Rosemary showered, got dressed and is now home for Thanksgiving Dinner with her family. Gratitude!!!! I'm feeling it deeply today. Extreamly greatful for all those poeple in my life that are so near and dear to me. 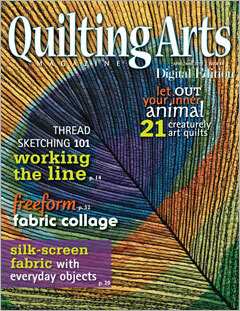 Do you remember this Quilting Arts Magazine cover? I fell in love with the cover the moment I saw it. I learned the peacock feather on the front was made by Susan Brubaker Knapp of Blue Moon River. This is not the best photo...I snapped it on my IPhone last night....yes...last night. I am the new adoptive parent of this amazing work of art and I am just over the moon with joy. And this beauty will be hanging in my living room, properly, as of now it is just put over a piece of wood and propped into place. I've got to get the right hardware to hang it. I have always loved Susan's work and now I'm the proud adoptive parent of three of her pieces. Do you have a favorite quilt or textile artist? Have you checked to see if they sell their work? You may be surprised to learn that many of the artists work that you love sell (are will to allow adoptions) their work. WARNING: If you are squimish and don't like skeletons except at Halloween....don't look below. Instead of answering each of the kindest e-mails inquiring about the healing process of my hand, I thought I'd just do a little show and tell. The Flamingo Family is gathering food for their Thanksgiving Feast. And all this time I thought they liked shrimp....silly me. Pumpkin just so happens to be my favorite too. I wonder if the Flamingos have a good pumpkin pie recipe? Yes, I am a self proclaimed pin keep nut....I absolutely love them and I have to say I went "ga-ga" at Quilt Market for Just Another Button Company's (JABC) new Pin Keeps. Who can resist the Mistletoe King Fairy Spoolkeep? What about the Mistletoe Queen Fairy Spoolkeep? I felt bonded to each and every one of them....really....tell me you could resist...just go ahead and try. Then there was the Peppermint King Fairy Spoolkeep....I felt like they were chocolates...who could stop at just one? Clearly not me....I had to have all of them....it's true. I'd have a very hard time putting a pin in Santa....but I bet I could put some Just Pins to embellish him. Looking at such wonderments can cause strong feelings of want and desire...for the cutest things ever. Cecile McPeak, owner of JABC, gave a Schoolhouse lecture at Quilt Market. I think she was very lucky to get through the entire presentation without me having a wonderment attack and grabbing every last thing she brought with her. You can find some of the Halloween Spoolkeeps HERE...I think they should be called Spook-Keeps....not that anyone asked. Prepare yourself for the Precious-est Keeps EVER! I was fortunate enough to receive a pattern for Eugenia Tuffet and a JABC US button for her US travels. You can take your Eugenia Tuffet with you on your travels and upload the photos to Eugenia's Facebook Page....YES...it's true and I'm not kidding. Yes....I'm going to share it with one lucky IHAN® Blog Follower....so if you would like to win the Eugenia Tuffet Pincushion pattern just leave a comment on this blog post and tell us what type of adventures you would have with Ms. Eugenia Tuffet. The winner will be drawn by random and announced on Friday.